There I was, in pre admissions for my procedure the next Wednesday (13/11), minding my own business, heart rate of about 170bpm (after a Valium to calm my disgusting Steroid withdrawals). Yes, I have committed to changing my life – I haven’t committed to being comfortable with it. I was at stage two, the surgical registrar. He was pretty cool, we were having a dry joke together, everything was going pretty well considering we were talking about cutting 3 inches of small bowel out. He left the room to finalise some paperwork and get a pathology referral form. When he came back, the mood had changed. Dryly and seriously he said “don’t panic, but you have a heart condition”. I laughed, thinking he was referring to my absurdly high heart rate even after taking something to slow it down. “You’re kidding” I said laughing. He produced the ECG I’d had done about 40 minutes before and showed me a constant, irregular rhythm. He wasn’t joking. 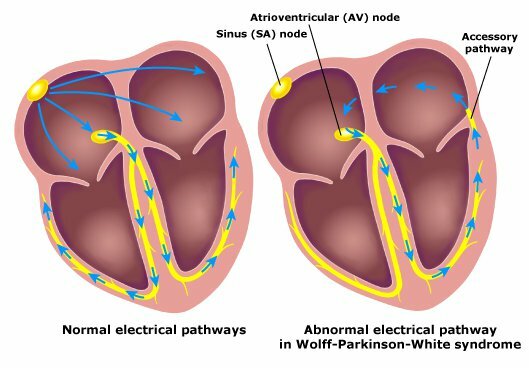 I had, well I have, a heart condition called Wolff Parkinson White. The best way I can explain it is I have a defect – an extra electrical pathway between the top and bottom of my heart that goes nowhere. It presents and is diagnosed on ECG as a “bump” in my heart rhythm. Sounds pretty innocent right? Apparently not… if the charge that goes from the top of my heart to the bottom misfires into this other pathway the bottom of my heart (the important bit from what I’ve been told) stops contracting, the tension goes out of the mussel and it goes “floppy”. From what they said it’s a very hard situation to shock someone back from because the mussel isn’t in arrhythmia – its totally flaccid. The strange part about all this – is I have no symptoms, aside from the ECG results. The defect is meant to cause fainting, heart palpitations for no reason, er, there is a list but I can’t remember it all. It’s meant to play particular havoc while the heart is under stress. Now, prior to us heading to New Zealand in August this year – I was running 4km at work in under 30min and another 4-5km at home on Thursday, Friday, Saturday and Sunday (I bowl Monday, Tuesday, Wednesday). I went to New Zealand fitter than I’ve ever been – but busted my toe over there and came home symptomatic – so the exercises has been severely reduced since then. That kind of exercise is a type of stress – and I’ve never even felt light headed. We discussed all this and the fact I’ve never fainted in my life… surely this wasn’t going to have any impact on my date? Sedation, the sedation they need for this surgery, is very deep and is the most stress they can put on a body. Therein lay the problem. Even thought I didn’t display any of the symptoms and even though the surgical registrar, the anesthetists and the cardiologist next door didn’t think it was a problem, the anesthetists wouldn’t see me until I’d been to the cardiology clinic. How do I feel? Broken hearted? Sorry – I think I’ve heard every heart related joke possible in the last few days. My date of the 13th of November has been cancelled until they can ascertain whether my heart problem needs to be corrected in a separate (but by no means invasive) procedure from my bowel. Life will have to wait a few more weeks it seems. The surgical registrar in Pre-Admissions got me a Cardiology appointment next Wednesday, coincidently on the day that the surgery was meant to happen – all I can do now is wait I guess. While I know the cogs are still turning – this hasn’t been particularly good on my head. I was already stressed from waiting for the first surgical referral – then everything happened so fast… now everything stopped again. I’m not sure where I’m really at. Like I said – I still see this as my best option with the best outcomes, I’m still committed, but my head is in no-mans land. At list one thing has come out of all this – my GI has to find me interesting now. I’m like, one in a million!